A 30-strong choir of gay men from Brighton has signed a £1m record deal. 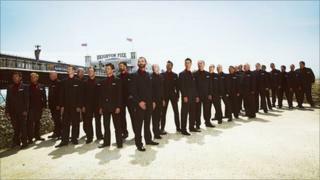 The Brighton and Hove Gay Men's Chorus has signed to Universal Records, home to music acts like U2, Paul Weller and PJ Harvey. The chorus formed six years ago to provide a community for gay men in Brighton to share experiences. It will release its debut album on 3 October and claims to be the first gay chorus to sign to a major label. John Hamilton, who co-founded the group with Jason Pimblett, said: "Rather than being a gay chorus, we're a chorus of men that happen to be gay. "When we started the chorus, part of what we wanted to do was to help to break down some barriers and misconceptions of what gay people are." The group includes a barman, a baker, a teacher and a travel agent. According to its founders, the group has avoided "clichés" of what could be expected from a gay men's chorus, choosing alternative arrangements of artists such as Ian McCulloch, Radiohead, Neil Young, David Bowie and Nine Inch Nails. "We wanted to concentrate more on the music and not necessarily be pigeonholed into 'oh you can do that but you can't do that'," said Mr Pimblett.